One of the toughest challenges today is not necessarily wanting to give back, but trying to figure out how to fit it into our already busy schedules. We host a variety of outreaches and ministries, and understand that it’s often difficult to attend them all. With that in mind, we initiated Serve Saturday as an opportunity for you to get a custom experience where you can come for a morning and be a part of multiple outreaches happening all on the same day. 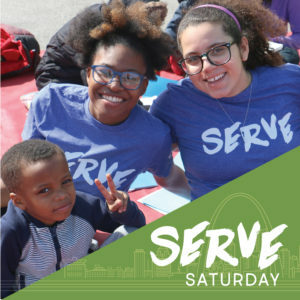 Serve Saturdays happen the first weekend of each month, and you’ll come together alongside other couples, families and adults looking to be a part of something bigger than themselves. Whether you consider our church home or are just looking for a chance to give back, this is the perfect spot! Now's your chance to be the change you want to see in our community. We're excited to have you on board! No, I'm a Serve Saturday Vet! If you've never done Serve Saturday with us before, we want to hook you up with a new shirt! Please indicate your shirt size above. If you are signing up for multiple people, please indicate their names and corresponding sizes below. Please don't forget your Serve Shirt! Serve Saturday is a chance to use the skills God has given you to make a difference. Please be sure to check any that apply to you or your team. Tag us on Instagram and use the hashtag to share your stories from Serve Saturday.